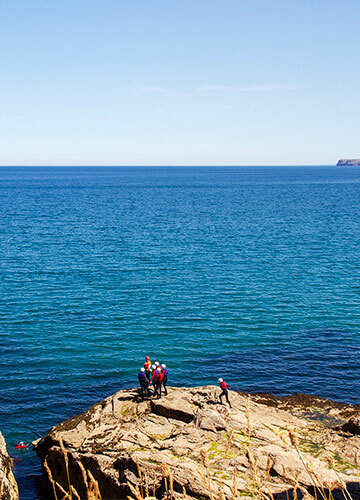 Coasteering is an exciting and action-packed exploration of a stretch of rocky coastline. 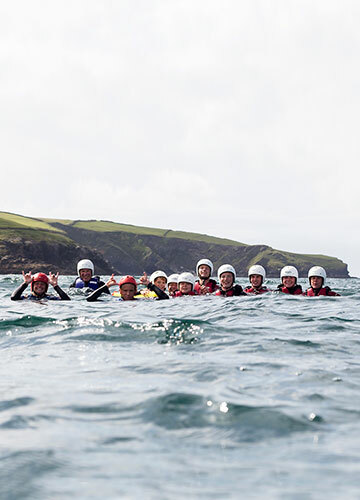 During our popular sessions we travel along an otherwise inaccessible stretch of the Cornish coast, swimming into rocky coves and through exhilarating whitewater features, adventuring into caves, and of course leaping from our favourite jump spots. We offer a range of routes and activity levels, making coasteering with Cornish Rock Tors a truly accessible experience for all ages and abilities. Our sessions take place in the beautiful National Trust location at Port Gaverne offering us access to a stunning stretch of unspoilt coast. 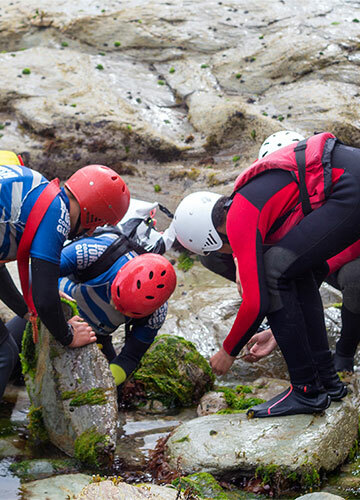 Designed for those who have never been coasteering before and suitable for all ages and ability levels, every activity on our introductory routes are optional allowing you to do as much or as little as you are comfortable with. 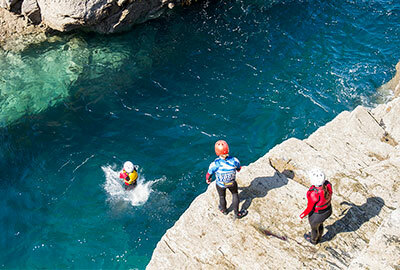 We’ll introduce you to all of the basics and help you get to grips with coasteering in a calm and supportive setting. 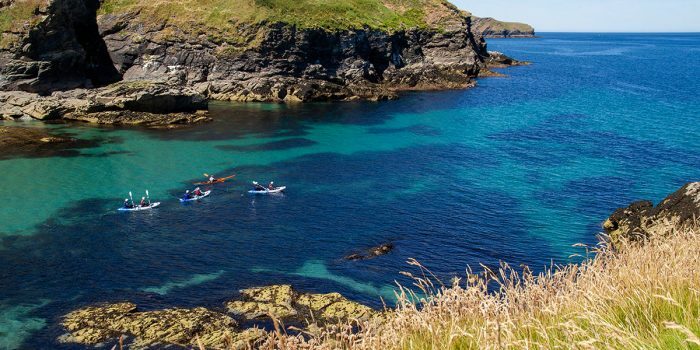 Run within the sheltered cove Port Gaverne which offers a variety of routes and options depending upon conditions, you’ll spend up to two hours in the water exploring the caves, scrambling over rock platforms, swimming, climbing above deep water and jumping from rock ledges of varying heights (should you choose to do so). Our Introduction Coasteering session is popular with families and groups of younger teenagers. Coasteering is a weather dependent activity and whilst the sheltered aspect of Port Gaverne means that sessions aren’t often affected by adverse weather conditions, in the event that we can’t run a session in the sea we can offer an alternative multi-activity session at our sheltered all weather quarry venue, just a ten minute drive inland. 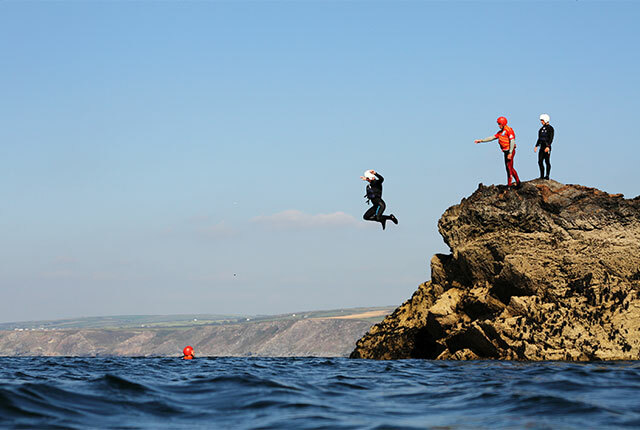 Introduction Coasteering costs £45 per person and includes the use of all necessary equipment, including a warm 5mm wetsuit, thick-soled wetsuit boots, a buoyancy aid and a helmet. All you need to bring is a towel and swimwear. Introduction Coasteering sessions typically last for around three hours, two hours of which are spent in the water or on the rocks. Participants must be aged 10 or over and competent swimmers (i.e. able to swim 50 meters in a pool unaided). 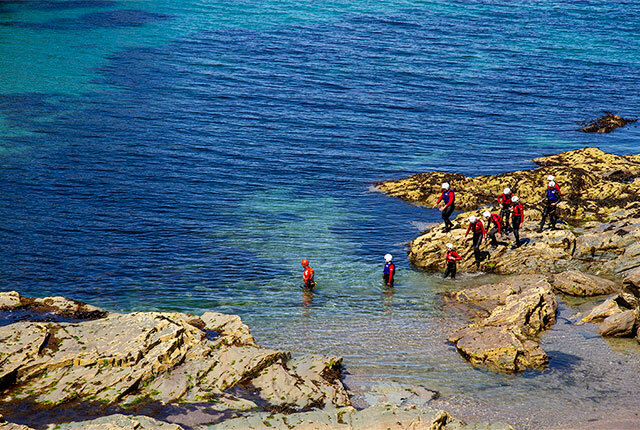 Our team of experienced coasteering guides are all Beach Lifeguards, as well as completing our in-house, location specific training. 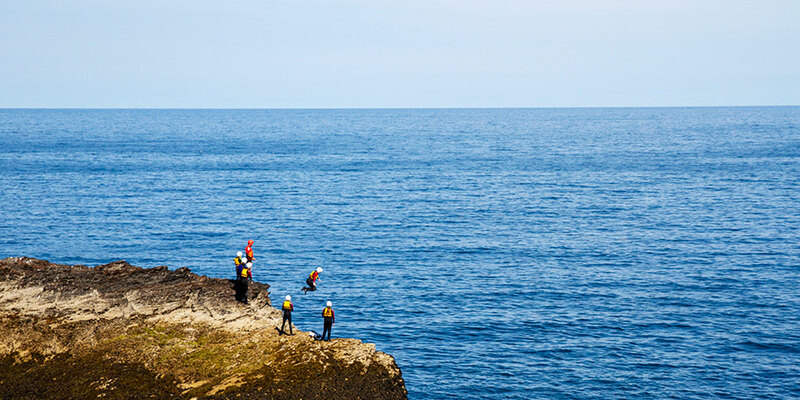 Cornish Rock Tors is a member of the NCC (National Coasteering Charter) and is licensed by the Adventure Activities Licensing Service adhering to all of their safety guidelines. 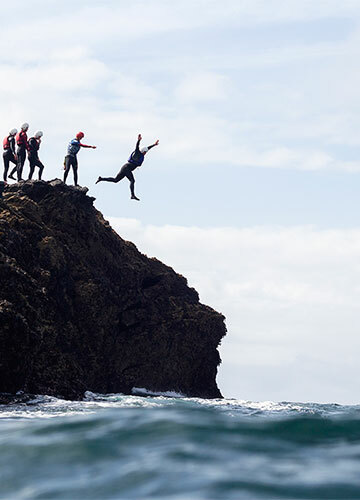 Aimed at adventurous, able adults and confident teenagers who have completed the beginner session, Intermediate Coasteering is perfect for those looking for a unique, challenging, and memorable outside experience. We’ll spend around two hours exploring an awe-inspiring stretch of cliffs, interspersed with coves and caves. We’ll climb across wave-swept rocks, swim through gullies and across open stretches of water and climb up progressively higher ledge systems to launch ourselves off some spectacular jumps along the way. Cornish Rock Tors’ Intermediate Coasteering session is our most popular and highly acclaimed activity. It provides an exhilarating challenge for all – even seasoned coasteerers. Whilst we can run advanced sessions in a greater range of weather and sea conditions, coasteering is a weather dependent activity; should we be unable to offer this activity at our Port Gaverne venue then we will offer an alternative multi-activity session at our sheltered all weather quarry venue, just a ten minute drive inland, or the option of rescheduling your session. 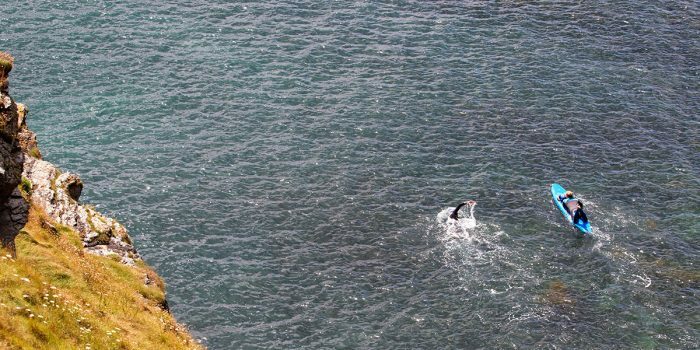 Intermediate Coasteering costs £45 per person and includes the use of all necessary equipment, including a warm 5mm wetsuit, thick-soled wetsuit boots, a buoyancy aid and a helmet. All you need to bring is a towel and swimwear. 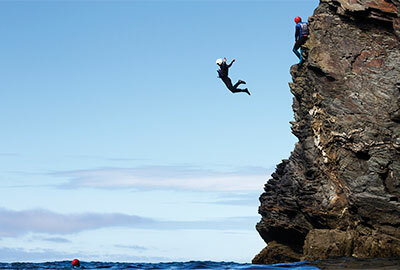 Intermediate Coasteering sessions typically last for around three hours, two hours of which are spent in the water or on the rocks. Participants must be aged 10 or over and competent swimmers (i.e. able to swim 50 meters in a pool unaided). We like to discuss your booking with you, so that we can tailor it to your own needs. "I Can’t thank them enough for making my holiday!" Oh my!!!! Just been coasteering with Cornish Rock Tors, absolutely fantastic!!!!! I Can’t stop smiling! I would highly recommend to anyone who loves the thrill of the coast. Cannot fault the guides, they were great!!! I Can’t thank them enough for making my holiday. Worth every penny. The location is superb, it’s like it was constructed for a coasteering experience. 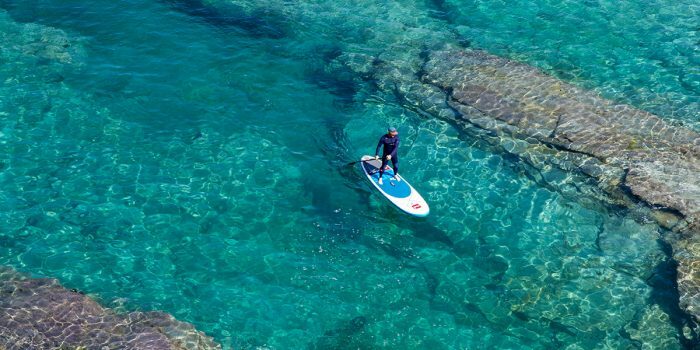 It’s uncanny how the rocks have formed perfect jumping-off platforms above nice deep channels of water, protected from the sea by a mini island. Cornish Rock Tors provide good equipment, friendly staff, and a fantastic overall adventure. "Can't praise these guys enough or do them justice in a written review." Brilliant day had by all. The instructors really know their stuff, put our minds at ease and had us leaping off cliff faces into beautiful coastal inlets. We swam, climbed, leaped and explored around some amazing coast not far from Cornish Rock Tors’ base. Well worth the visit. This was purchased by my wife as a present. Can honestly say was one of the best presents I’ve ever had. The guides were the best. Thank you. "Hand yourself to their good care and let the magic happen!" I first went coasteering with Cornish Rock Tors at the end of July and….have been back every weekend since. Each session was different and I had an amazing time and lots of fun each time. Every single of their guides are knowledgeable, professional, reliable on top of being fun and kind! The director, made you feel welcomed and at home. I cannot recommend them enough and I am “blaming” them for making me fall in love head over heels with this part of the country and coasteering!